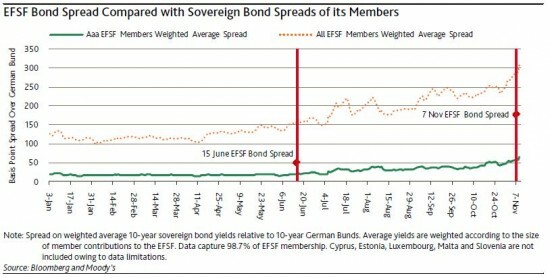 Remember the hoopla about beefing up the EFSF? It’s not up to the task. While professionals debated the merits of 1tn v. 2tn sensible folks – like my Mum – asked why jumbling up the exposures would make un-creditworthy deadbeats creditworthy? EFSF bonds are now ~300bps over Germany. The market is looking through to the underlying credits. That’s a problem, because if you start with a 2% yield for Germany, it makes it very hard to get yields sub-5% for those tapping the EFSF, and that increases the risk of unstable debt dynamics. 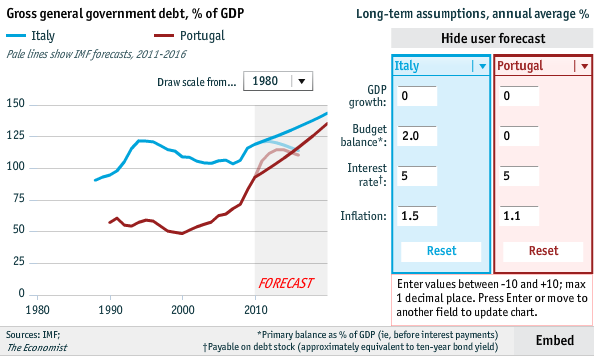 You can see that with a 5% yield and a modest downgrade to growth and budget balance numbers, both Italy and Portugal become unstable. A credit crunch led European recession is almost a certainty — it doesn’t matter who leads Italy or Greece. A mild European recession will threaten the stability of European debt dynamics and the only solution is going to be painful austerity (to re-establish credibility as a payer) or leaving the EUR, so that net exports can help the adjustment.